SOUTH PASADENA — An author night reading and performance with America’s foremost peach-farming family — David Mas, Nikiko and Marcy Masumoto — will take place on Thursday, July 18, at 6 p.m. at Library Park (in front of Community Room), 1115 El Centro St., South Pasadena. 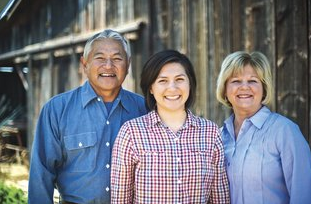 Established in 1948, the Masumoto Family Farm consists of 80 acres south of Fresno and grows certified organic peaches, nectarines and grapes for raisins. Kyodo Taiko from UCLA will perform. Co-presented by the South Pasadena Public Library, Friends of the South Pasadena Public Library, the South Pasadena Chamber of Commerce, and Bissell House Bed & Breakfast, with support from South Pasadena Farmer’s Market, South Pasadena Community Services, and California Arts Council. Free refreshments. No tickets or reservations. Seats are very limited. Lawn chairs and blankets recommended.